Away from the roaring road, is a green tunnel that leads down to the river. I crawl down it most days, on foot or by car. 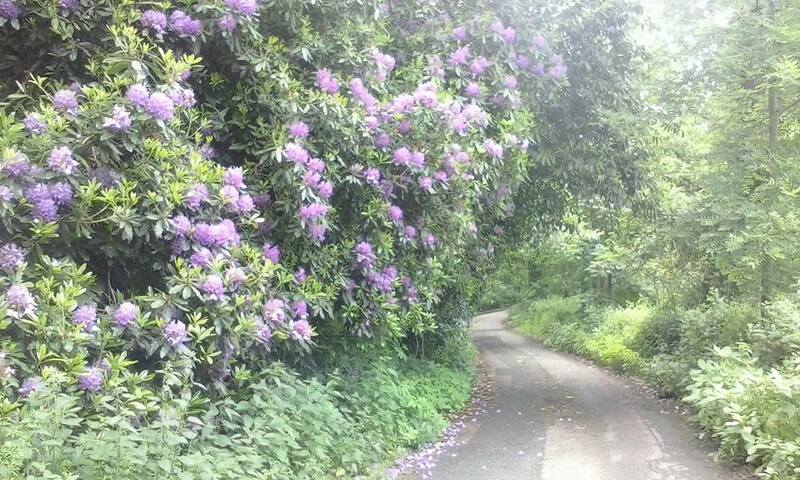 The lane is narrow and lined by mighty oaks and monstrous rhododendrons. They are lurching forward, always stretching and growing and trying to claim back what is rightfully theirs. Their thick arms reach out over the lane, linking up to create a canopy that shuts out the sun. Lower down, the nettles and brambles do the same, creeping out across the ground, and the tunnel grows tighter. Twisting around the oaks like old friends, filling every available space, the rhododendrons are a wall of lilac filled with bumblebees. Squirrels dart from tree to tree, playing a game of chase up the trunks of the oaks. The further you wander from the road, the deeper she embraces you. Mother Nature. She makes you hers again, just for a time. No human noise now. No human mess. Someone will come along soon enough. Someone will come along with the hedge-cutter whirring, with the strimmer slicing and chopping, to tame her wild ways. They will hack at her arms and shave back the unwanted feasts of nettles, campion, cow parsley and garlic mustard. No one knows what they are. No one cares anymore. Trimmed and contained, she will return to her patience. For one day, no one will come. Because no one will be left. No vans or trucks will rumble down from the road. No chainsaws will come to mutilate her. Mother Nature will be free at last. She will reach and claw greedily and hungrily across the lane, grasping hands with the other side and pulling tight. She will awaken for good. She will take it all back. Down the lane and over the bridge, but no human feet will fall here again. The railings of the bridge will rust and drop into the water. The concrete will be forced apart by fingers of creeping green. Past Twisty Corners, no cars will take the corner too fast, no small hands will stand on the curve and reach for blackberries. Dandilions will push up through the tarmac. Again and again until they dismantle it all and throw it away. The fence posts will fall and rot. The barbed wire will be buried under the ground. The hedgerows will grow thicker and fatter and taller until the lane is gone. Until it is swallowed up. The houses will crumble to dust. The things that we have built and lived in and filled with things we worked a lifetime to own, will fall asleep and die just like us. The seeds will be sown undisturbed and taken by the breeze into the buildings, where they will distribute over and over again until plants and trees thrust through the rooftops and out of the chimneys. The windows will be smashed. It will all be broken apart. Once we are gone. When we have fought our last war. When we have drilled the last drop of oil out of the earth. When we have starved the land of the very nutrients we needed to survive on it. Once we are all gone, Mother Nature will still be here and she will sigh her hefty relief that our brief time here is over and done with. She will laugh out loud at the foolish belief we had they we would destroy her. She was just biding her time. Just waiting us out. Like a patient mother waiting for a spoiled and ungrateful child to finish their tantrum. Once we are gone, the world will recover quickly. Mother Nature will wrap her arms around this ball of mud and water and she will heal it. We could have been glorious. But like a great man once said; we let the demons run amok. We were born to be sheep and follow the herd. We were told who to hate and what to fear, and we were conditioned to work and consume and fill our homes and lives with things to throw away. And the saddest thing; it was always just a handful. Just a handful of greedy soulless devils with blood on their hands and money in their pockets. Just a handful of demons who ran amok, putting pound signs on everything, taking every last thing from the earth, unable to listen, unable to care, unable to change. She won’t miss us. She will forget us, once we are gone. Angry, poignant, and and as always beautifully written. Wow. What a thing to read, first thing on Monday morning. Well said. The mother is the one in control, not the children. Thank you so much for reading kerry !